If you are shopping for a turkey fryer which is highly rated by experts and customers alike, consider the Bayou Classic 1118. This 32-quart fryer can handle turkey, chicken, vegetables, seafood, tamales, and more, making it an all-in-one choice for preparing a wide range of cuisines. Lauded by buyers for its solid construction, it provides you with excellent functionality at a reasonable price. Let’s take an in-depth look. 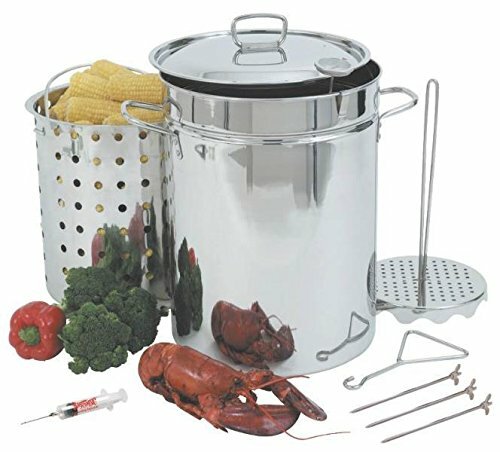 Your purchase comes with the pot and lid, basket, hook and hook plate, injector, thermometer, and three skewers. Cook Just About Anything: While this is sold as a turkey fryer, you can prepare so many different dishes in it! Here are just a few meals that reviewers have prepared in the Bayou Classic 1118: Turkey, chicken, prime rib, crab, spiral ham, chili, tamales. I’ve prepared turkey, vegetables, and ham in mine, and have had outstanding results every time. Stainless Steel for Durable Construction and Easy Cleaning: Both the pot itself and the basket are made of stainless steel. The design includes a rim inside for the basket, which keeps it from resting on the bottom—this in turn allows for better cooking. The steel is sturdy and ridiculously easy to clean. This turkey pot is incredibly versatile, and can be used to prepare a ton of different dishes with ease. The construction allows for optimal boiling and/or frying. All the accessories you need are included, even a thermometer. The huge capacity means you can prepare a lot of food all at once—ideal for serving large parties. The stainless steel is strong and holds its polish nicely. It is durable, aesthetically pleasing, and easy to keep clean. The price is great, considering all the accessories you get along with the cookpot. One concern is that I did see multiple reviews that claimed this pot is aluminum, not stainless steel. This was not my experience, so I am not sure what it could mean. Perhaps these buyers were shipped the wrong product. A couple customers said they discovered a hole at the bottom of the pot. The one I purchased was flawless, and has held up great to lots of use. Perhaps the reports of holes involved damage during shipping—always a risk when you buy an appliance online. A better question might be, “What is the Bayou Classic 1118 Turkey Fryer not best for?” The versatility of this cook pot is incredible. I would recommend it highly though for those who need the large capacity, either to serve a big family or to cook for parties and events. The Bayou Classic 1118 Turkey Fryer has received numerous excellent reviews online, and with good reason. When I tested it out, I too was impressed by the materials and construction, and the meals I made were easy to prepare and came out tasting great with just the right texture and consistency. I can enthusiastically recommend this fryer to anyone looking for a large capacity cook pot which delivers. New Bayou Classic 1118 32 Quart Stainless Turkey Fryer Deluxe Kit Basket 5701131"
Let’s review the features, pros and cons of the Char-Broil The Big Easy Turkey Fryer so you can decide if this is the right product for you. The King Kooker 1265BF3 is a high-capacity turkey fryer which can also be used to prepare poultry, veggies, and other delicious meals. This 32-quart fryer can handle turkey, chicken, vegetables, seafood, tamales, and more, making it an all-in-one choice for preparing a wide range of cuisines. It is the centerpiece of every Thanksgiving dinner, and possibly the most stressful piece of cooking of the year! Is It Safe To Use A Turkey Fryer? Keeping in mind your safety and the ambiance of your home, is it safe to deep fry your turkey? Older PostHow Long Does It Take To Cook A Turkey?